This dish is a classic Harvey family meal and incorporates ingredients famous in the region and blocks. Outside the Slate Creek school block, 1 mile from their organic, Wits End block, are rows of almond trees. These not only provide a beautiful, blossoming avenue to frame their country homestead but allow a bounty of almonds. This recipe compliments the robust, generous and fruit driven Shiraz that is our Luna and utilises quintessentially regional and foraged ingredients. This recipe compliments the robust, generous and fruit driven Shiraz that is their Wits End Luna Shiraz and uses quintessentially regional and foraged ingredients. This dish from Harvey family, who own Wits End Winery, is a favourite meal and incorporates ingredients famous in the region and blocks. 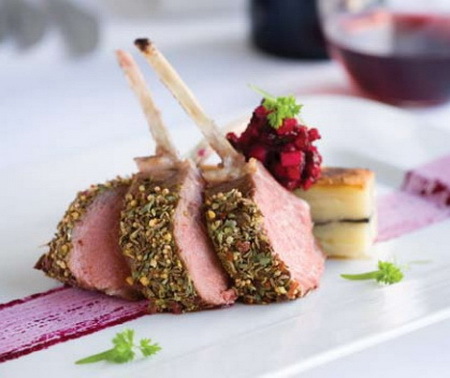 This recipe is developed by Harvey family and pairs beautifully with their Wits End Shiraz. In a heavy pan over medium heat, toast the mustard, fennel & cumin seeds. Grind in a mortal & pestle or food processor to a fine powder, reserve one teaspoon, mix the remainder with the Almond Meal. Season with salt & pepper & put in the hot oven for 8 minutes (for medium rare). Remove from oven & spread the seeded mustard on top & press the almond meal mixture on top. Place back in the oven for 1 to 2 minutes until brown. Remove from the oven & rest in a warm place for 6 minutes before serving. Since 1897, six generations of the Harvey family have grown grapes in the McLaren Vale wine region. One of the pioneering families in the region, the family still resides in that original homestead on the Slate Creek estate, in the historical township of Willunga. In addition to grapes, the family have also grazed livestock, including sheep. These animals have a symbiotic relationship with the land, roaming through the vineyards and keeping natural pests at bay by eating unwanted plants between vineyard rows, whilst naturally fertilising the soil. This recipe is provided courtesy of the Harvey family and the post is sponsored by Wits End.